I've been hard at work on the new house, looking for the perfect pieces of furniture for our spaces. Seriously, I can't tell you how many hours I've spent on the internet looking for things that fit the aesthetic I want but stay in our price range. It's hard! My most recent obsession is finding the right chairs for our living room. I've found styles I like but the fabric leaves something to be desired or vice-versa. I suppose my pain is your gain, because today I'm here to share a gem of a furniture company with you. 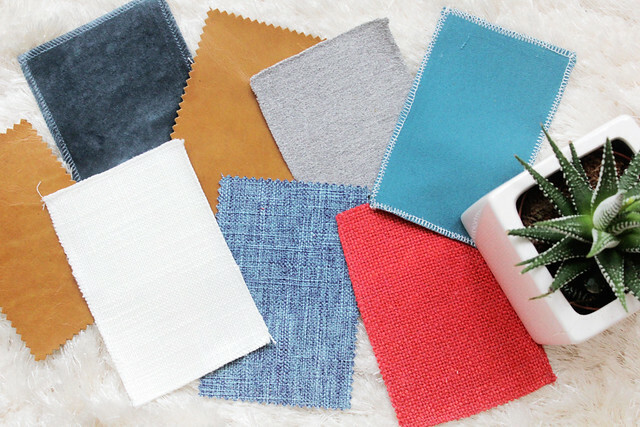 Interior Define is a site that lets you choose your style AND fabric. They are totally changing the way we shop for furniture. You like that chair but hate the color? Customize it! You think the style is great but the legs don't fit the vibe you're going for? Customize that too! 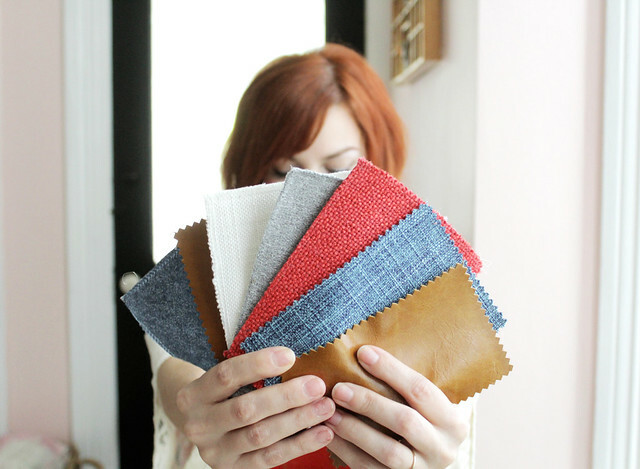 Interior Define offers 40-50 different fabric options, depending on the piece you are creating. I'm pretty picky about fabric quality (everyday fabric snob over here), so being able to choose sizable swatches to touch and feel before coming to a decision was hugely appealing to me. *Comment back on this post with the link to the piece you'd buy if you won! Interior Define is also offering $100 off any order over $1000 until 5/15/16 with the code SK100. I will randomly choose a giveaway winner from the comments one week from today (4/28), so make sure you register your email address with them. 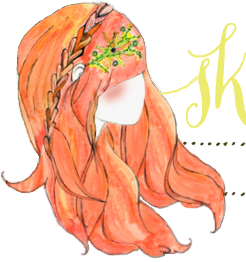 Also, you can check out my favorite picks page to get an idea of what pieces I'm dreaming of. Good luck, friends! so many great choices! I've wanted a sectional for awhile, so I'd choose the Caitlin sofa in cerulean. I love the shelter sleeper! I would love to buy the Asher in coffee! im in love with the sloan! I really, really want a sectional, and I have loved the Sloan for a very long time. Wow these pieces are gorgeous! I really need a reading chair in my bedroom. This giveaway rocks! I am in the market for a love seat and gray would be perfect!! I love the Rose chair in the sapphire velvet! We just bought a new house and this would look so great in my new sunroom!! its speaks to me on soooo many levels. i'd put that sofa at the foot of my bed and basically, i'd just live there reading all of the books! im a huge reader so a comfy space is definitely important and that is definitely it! and it would be facing my tv but most importantly, all of my books. that sofa is what reading dreams are made of! I would love the Caitlin in Ruby! Love that Asher sofa. Now the question is, which color?? What an awesome idea!! I love their mod velvet fabric in sapphire. I think it would look rad on just about everything, but looks especially great on the caitlin sofa. So many fabric options! I love the Sloan sofa with the chaise in Charcoal. The Sloan fabric sofa with right chaise would be perfect for my family of five! Also, picking my favorite color: cerulean blue would be a bonus, because you just don't get the option for cerulean in a modern sofa. It beats our old brown sofa any day! Wow the Caitlin is the perfect combo or retro and modern for my style! Love the citrine color. Just bought my first house and this sofa would look rad! Coolest giveaway ever! I totally love the concept of choosing your fabric and legs! Oh dear - these are GORGEOUS! I love the Caitlin - especially because of those lovely mid-century legs! I feel like if I were to have the pleasure of having that couch in my home, it would have to be in a statement color, like Robin's Egg! 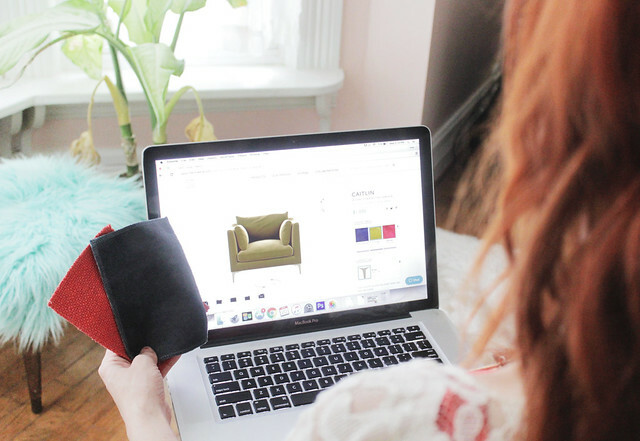 Drooling over everything but we're in need of the perfect chair! Thanks for doing this! I'm slightly obsessed with Interior Define and their processes. My husband and I just had a bid accepted on a house and are in the process of patiently waiting for our closing. We will definitely need loads of new furniture! My current favorite is the Caitlin in Narwhal Mod Velvet but don't make me pick my favorite legs. http://www.interiordefine.com/shop/caitlin-chair#LK-14342-25/Leg008-3 I think the sapphire might be for me! Love your blog! I love the Kaitlin series! I would probably pick mustard or robins egg blue :) Thanks for introducing me to this great furniture website! The prices are good too! Love the Henry couch in Ruby! My boyfriend of 5 years and I are moving in together and this would look amazing in our new place! This bad boy has won my heart. Difficult decision to make! Practicality makes me want to vote the Shelter Sleeper. But the fabrics are just too beautiful for the Caitlin. I'd get a pair of chairs - perhaps in Sapphire. They named the Caitlin after my friend so I'd def have to get it! I am obsessed with the Gray sofa! Its still got that mid century look I love but it's so different! I love the rose above but didn't see it on the site. The Alice is sweet, too, but the love seat "gray" or the Caitlin love seat are a delight. I'd need a whole set, I guess! I love the Harper sofa! I want the Sloan couch in turmeric (or any couch in turmeric)! I love the Caitlin in Narwhal, especially because it comes in velvet. My cats don't like scratching velvet, so they won't destroy it! I'd probably choose this http://www.interiordefine.com/shop/sloan-chaise-rt I'm remoedling inside and will need new living room furntture. It would be so exciting to win this. Their fabric choices are so great! I'm a big fan of the Sloan Fabric Sofa with right chaise in Cerulean Blue with Brass Sloan L Legs & the Mustard Sloan Fabric Chair with Sloan Brass L Legs! OH MY GOODNESS! I love their products! I would love a perfect Sloan couch. Even the name is perfect. Ooh, Caitlyn, in mustard, or turmeric, or possibly citrine. Mmm, perfection. SLOAN sofa with cerulean blue basket weave fabric + brass sloan l leg. aaaaannnnndddd I'm in love. I love the asher sofa so sleek and modern! The Rose Sofa in flint, perfect! I love the robin's egg blue color with brass legs! Perfect way to add a little flash, but dark enough to not show every little kid hand print! I would get the Sloan in Cerulean Blue! A Sloan. I have an ikea karlstead and it looks pretty simular. but the Oxford Blue version is a veeerrrrry close second! I think I would get the Rose sofa, maybe in Cerulean blue? Though Citrine is also pulling at my heart strings. http://www.interiordefine.com/shop/gray-69 Love the Gray Fabric Sofa in Turmeric! It looks simple and comfy! The Caitlin in Robin's Egg. the Rose in coal I think. :-) Thank you!!! Need a new loveseat and definitely digging the sloan couch! Thanks for hosting this giveaway. i'd prob pick the sloan in ash. but i'd gift it to my parents, so i'd let them chose! I love the Caitlin chair. I would probably get it in Charcoal. ooo the asher in any color is gorgeous! Ohhhh my gosh the Caitlin is everything: http://www.interiordefine.com/shop/caitlin-sofa I love the velvet!! We just bought our first house, it's a bit of a fixer upper (pink carpet and pink countertops, even in the bathrooms!) But we are so excited to make it our own and this couch would look amazing in our new living space! LOVE this little sofa; it would be perfect in our space for my fiance and I! I would get the Lucy in Linen Pebble Weave. Love it! My husband and I, as newlyweds, only have hand-me-down furniture and are in the market for a couch! I'd love to get the Sloan sectional couch in chestnut or cerulean blue, with the oiled walnut tapered square wood legs! So lovely! Well, a girl can dream right?! Oooh, I just love the Alice chair in citrine. I've always wanted cozy swivel chairs like this! Owens or Caitlin in Cerulean Blue or the Sloan in Vista Blue. Any of these would be amazing to cuddle up on with a blanket, wine, and a good book. Such a rad giveaway! I would choose the Owens chair in Oxford blue hands down, it's gorgeous! And I'm signed up for their newsletter. My husband and I are poor and need style in our move to a South Dakota apartment! We would love the Kelley Fabric sofa in Turmeric that seats three! My husband and I are poor and need some style in our move to our South Dakota apartment! We'd love the Kelley Fabric Sofa in Turmeric that seats three! My husband and I just bought our first home, and our added to our family with rescuing a dog, we've named Ziggy. (After David Bowie). While we love cuddling on our small couch, it is more fun with Ziggy but nearly enough room. the Catlin couch with chaise, in evergreen would be great. We could all snuggle together. 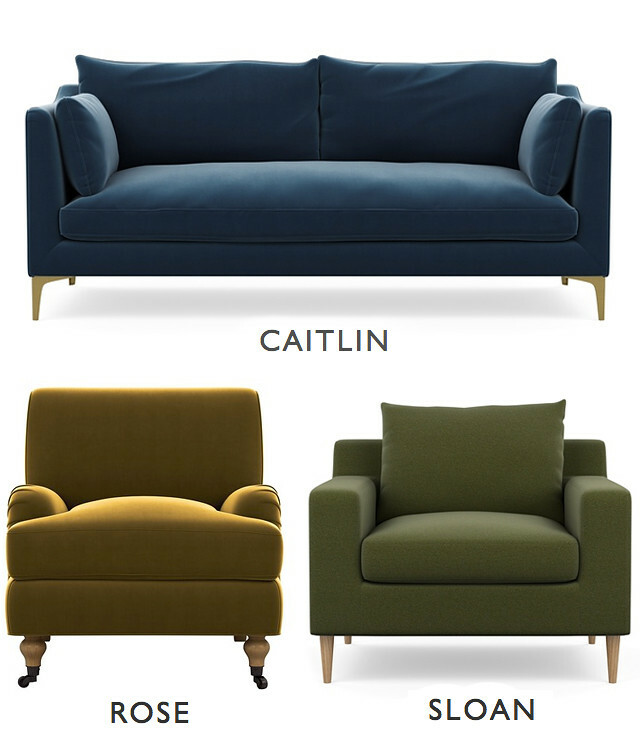 Would definitely love the Caitlin armchair in a textured linen! I am moving in two weeks and have been searching for the perfect new couch... I LOVE the Caitlin in Cerulean Blue with the natural oak legs. And also the Vista Blue fabric. Gorgeous! The Sloan sofa with the chaise in ash grey and with the oiled walnut legs...THE DREAM!!! But I have been considering a leather piece and the Sloan would be great too!! I love the Caitlin Sofa in Turmeric SOO much. I love the clean style, and I think the new felt would hold up to a certain puppy who loves to look out the window at the world. What a great giveaway! http://www.interiordefine.com/shop/gray-69#NT-62893-9/ love it, its perfect to watch tv, sleep and everything. I LOVE the Kelley Sleeper sofa in Charcoal. It's beautiful & functional. Would be great in our home for when guests stay over! The Caitlin sofa. So pretty! I've been wanting to get a new couch for awhile, I really like the Lucy. I'm in the process of buying a new home which means new furniture!!! The Caitlyn one looks perfect! The Henry in Evergreen sure looks nice. I'm choosing the Sloan accent chair (http://www.interiordefine.com/shop/sloan-accent-chair), but I also like the Owens and Kelley chairs! I love the Rose couch! It's just what I've been looking for my new living room! I was excited because my roommates and I could really use a nice looking new couch. But after looking at the prices I realized even with $1000 off they would be out of my price range. The Asher in robins egg with chase lounge. I would love the Caitlin chair in garnet, I've been looking for something just like it! I need this Caitlin chair in my life. It's the perfect size, shape, and has such great fabric options. Plus, the leg options. I'm dying here. Caitlin in tumeric is everything I need in my life. This is so perfect! I just bought my first house and am also in the process of trying to decorate on a budget! I love the Sloan sofa in Dove with the Natural Oak legs - it would look so pretty in a bright, white living room! I love the Caitlin sofa in ocean. We could really use a new sofa and that one is perfect! Thanks for the opportunity. I think I would pick the Ainsely loveseat (in either Lagoon contrast stitch or Evergreen) to replace a hand-me-down single chair to give our downstairs' living room area a bit more comfy seating (instead of always dragging the dining room chairs over). love how classic this sofa is! It's so hard to pick, but I would get The Lucy couch! I've been eying these couches up for the past year. We just put an offer on a house today and will be moving in a few months, so we are definitely in the market for some new living room furniture! My very favorite is the Rose sofa, although the Harper might work better for my family. Oh crap, I LOVE the Sloan with the right chaise. It looks sooo comfy! Caitlin sofa in Citrine is my dream couch! I'm obsessed with the Ainsley chair in Granite. I loooove the lines of the Sloan chair! Love the fabric options as well as the brass plated legs. Major heart eyes! Not to mention they have a color called 'narwhal'... holy major points. We just bought a couch and now I'm on the hunt for a good sitting chair. The Rose chair in Oxford blue would be just too too good! We just bought a couch, so now I'm on the hunt for the perfect sitting chair to go along with it. The Rose chair in Oxford blue velvet is just too too good! Time For Spring Dress Sewing!